Over 25 academics from five institutions in four countries graduated simultaneously after successfully completing a higher education teaching and learning course together. They included lecturers from INTI International University & Colleges who received the Laureate Certificate for Teaching and Learning in Higher Education during the recent virtual graduation, a first of its kind cloud event at INTI International College Subang. 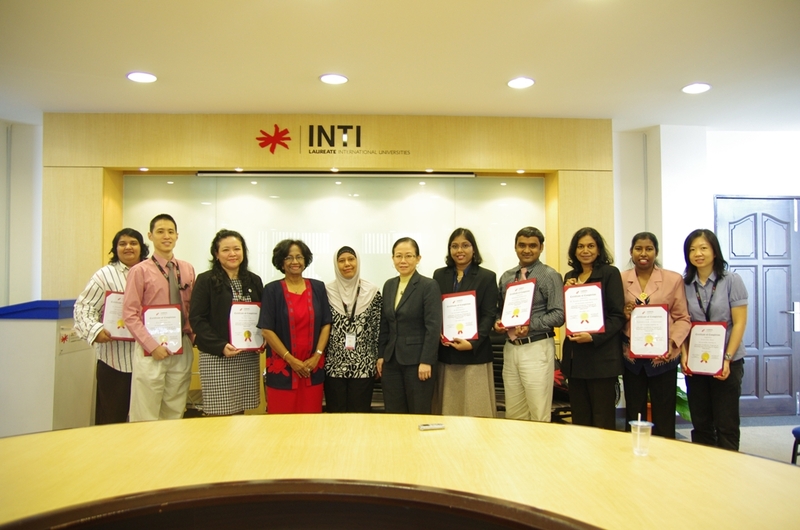 Dr Anucia Jeganathan (4th from left) with the graduates from INTI. Access to innovative teaching and learning courses developed by Laureate Network Products & Services to advance academic delivery skills, and a global academic community within the world’s largest and fastest growing network of private higher education institutions has given lecturers of INTI a distinct advantage in upgrading their abilities as educators. “The opportunity for our lecturers to enhance their abilities is extensive as there are programmes which allow them to keep abreast of the changing education environment as well as interact with fellow academics within the Laureate network. Our lecturers don’t just teach – they facilitate learning. They learn to create learning environments where students can thrive,” said Dr Anucia Jeganathan, INTI’s Executive Vice President, Academics & International Partnerships, and a member of the original team that reviewed the programme modules when it was first introduced in 2010. Internationalism and innovation are important pillars that hold up institutions of the Laureate International Universities network and the opportunity for members such as INTI to gain access to knowledge, thought processes, best practices, academic talent and resources across the distances makes this ‘Laureate advantage’ a unique one. Through Laureate’s support, INTI is able to provide its students and staff with front-row seats to cutting edge global events such as the World Business Forum and Clinton Global Initiative, where they can learn from top global leaders discussing issues affecting the world today. Students also have access to international faculty, overseas guest lecturers and study tours to INTI’s partner universities in other countries. This provides them access to an international learning experience beyond Malaysia as part of their studies and as part of their world class education at local prices. Students of INTI benefit not only from the institution’s over 25 years of experience and strong track-record, but also gain from the global synergy and resources that Laureate International Universities provides. Laureate – the world’s largest private education network – has a presence in 29 countries, with more than 60 accredited universities and 130 campuses, serving more than 740,000 students globally. For more information on INTI’s courses, call 06-7982000 / 03-56232800.